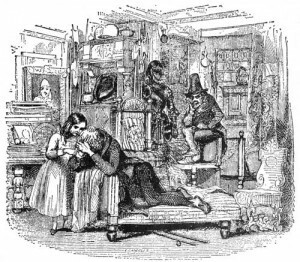 'The Old Curiosity Shop' by Charles Dickens, will be dramatically retold and adapted for Warwickshire Libraries by Actress, Storyteller, Performer Julie Ann Cooper of Intimate Productions on the Saturday 6th October 2012 both at Stratford Upon Avon Library 11.00am -12.00pm and Leamington Spa Library 2.00pm - 3.00pm. It is suitable for family audiences and all ages from children 7yrs + to adults. 'The Old Curiosity Shop ' is a curious Tale full of mystery and mischief; gripping adventure and tantalizing suspense; with strange spine chilling characters that lurk in the dark deep shadows. Yet the Tale is illuminated with colour, warmth and light, that shines through the hearts of little nell and loyal kit; and the unexpected acts of kindness, that cross both their pathways throughout the Tale. During 2012 Julie Ann Cooper has performed 'The Old Curiosity Shop' for Coventry Libraries World Book Night on the 23rd April, and also for Birmingham Libraries Young Readers Festival at Sarehole Mill and Blakesley Hall. Julie has performed, Dickens Tales 'Bleak and Curious' at Derby Library 'Listen While you Lunch Event' on the Tuesday 7th February to celebrate Charles Dickens Birthday. She will also be performing 'Bleak House' for Adults and Older children during September in the Midlands.